Terra offers options for those who desire to take one course or earn a full curriculum leading to an associate degree in applied business, applied science, arts, individualized study, science or technical studies. Students who wish to continue their education may transfer credits to a four-year college or universities.Terra has state-of-the-art equipment and facilities, as well as instructors that give students a quality technical education ensuring they gain a competitive edge in the job market.Admissions representatives are happy to talk with you and show you our exciting campus.Terra State Community College provides support and opportunities for America's veterans. You chose to serve your country, and now it's time for us to serve you. 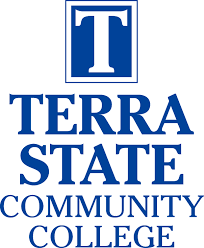 Terra State works hard to assist you and your families by meeting your complete educational needs.